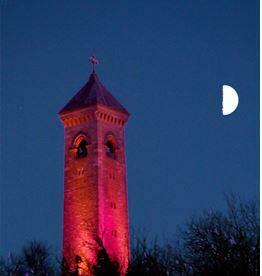 Why is the Tyndale monument in North Nibley, near Wotton under Edge, bathed in Purple light on Wednesday night, 24th October? The answer is that the Rotary Club of Cotswold Tyndale, in conjunction with the trustees of the monument, decided to mark World Polio Day very visibly, starting today and for the next few nights. With a spectacular sunset and an almost full moon rising, Cotswold Tyndale RC President Roger with friends, including his spaniel Ted, climbed the steep hill to witness the sky turn from blue, to red and purple and finally at dusk the William Tyndale monument was bathed in a purple hue. The monument will stay lit for this week and is clearly visible from the M5 and the A38 in the Nibley/Stroud area surrounds.